The board of directors of CONSERVATION MANITOU cordially invites you to celebrate our busiest year ever by joining us for the 6th Annual Meeting of Members to be held Saturday, May 18, 2019 at 2PM at the Ivry-sur-le-Lac town hall. We are also proud to present you our 2018 Annual Report attached (see below). 1- Raised $2.25 million in cash donations from over 170 members and received $3.6 million in land donations (eco-gifts) from 12 landowners. 2- Acquired 1,330 acres of eco-sensitive natural areas with 4,400 feet of shoreline on Lake Manitou and 2,500 feet of shoreline on Horseshoe Lake. 3- Rezoned 638 acres with the help of the municipalities of Ivry-sur-le-Lac and Sainte-Agathe-des-Monts, and created 8 protected natural areas around Lake Manitou. 4- Partnered with Nature Conservancy of Canada in acquiring 541 acres to help maintain ecological connectivity in the greater region. 5- Grew the Stewardship Fund to $136,000 to help cover the ongoing carrying costs of our conservation lands. 6- Created an Environmental Protection Fund to help the Municipality of Ivry-sur-le-Lac defend its bylaws against the lawsuit launched by l’Association des pêcheurs sportifs du Québec and formed a special committee with AALM and the municipality to continue closely monitoring this very serious threat to the health of Lake Manitou. Together we have accomplished these results with the strong support of our members and partners such as Nature Action Quebec, Echo Foundation, and Fondation de la Faune. Our conservation efforts, which include ongoing stewardship of our acquired lands, depend on your continued support. Thank you to all who are helping us Preserve the Future Together ! November 30, 2018 (Ivry-sur-le-Lac, Quebec) – CONSERVATION MANITOU is pleased to announce that it has completed the acquisition of an additional 103 acres of forest and wetlands within Lake Manitou’s watershed. Approximately 80 acres were donated by Aaron Remer under Environment and Climate Change Canada’s Ecological Gifts Program, while 23 acres were acquired from Elizabeth Barker. CONSERVATION MANITOU now has 1,330 acres of natural areas under its protection. As a reminder, CONSERVATION MANITOU is still fundraising to endow its Stewardship Fund with $250,000 from which it can generate a steady income to pay the ongoing carrying costs of its conservation lands. CONSERVATION MANITOU is a registered charity and qualified recipient of Environment and Climate Change Canada’s Ecological Gifts Program. Its mission is to preserve and protect the ecosystem and natural environment of Lake Manitou and its surroundings, by acquiring land and conservation easements, either donated or purchased, and providing stewardship in perpetuity. It is one of the leading organizations dedicated to the preservation of natural areas in the Laurentians with approximately 1,330 acres of conservation lands under ownership located in the municipalities of Ivry-sur-le-Lac, Ste-Agathe-des-Monts and Saint-Faustin-Lac-Carré. July 12, 2018 (Ivry-sur-le-Lac, Quebec) – CONSERVATION MANITOU is pleased to announce that it has completed the acquisition of over 6 acres of forest comprising a hilltop on the south side of Lake Manitou. The land was donated by Ken Hague on behalf of his family in loving memory of parents Daphne (2013) and Kenneth (2018). At its Annual General Meeting of Members in May, the Corporation appointed Delphine Favorel to its Board of Directors in replacement of Arnaud Holleville whose position as Environment Coordinator at MRC de Papineau prevented him for continuing as a director. “We thank Arnaud for his valuable contribution to our board and welcome Delphine as his replacement. Like her predecessor, she holds a master’s degree in biology. Over the past few years, she has been working with Réseau des Milieux Naturels Protégés, the largest association of land conservancies in Quebec, and her scientific background combined with her knowledge of the industry players in Canada will be a tremendous asset to us.” states Stephen Takacsy, Chair of CONSERVATION MANITOU. Finally, in order to help reach its Stewardship Fund Capital Campaign target of $400,000 CONSERVATION MANITOU is now accepting donations online using Visa, Mastercard or Amex to securely support its fundraising efforts at https://www.conservationmanitou.ca/en/donate/. CONSERVATION MANITOU is a registered charity and qualified recipient of Environment and Climate Change Canada’s Ecological Gifts Program. Its mission is to preserve and protect the ecosystem and natural environment of Lake Manitou and its surroundings, by acquiring land and conservation easements, either donated or purchased, and providing stewardship in perpetuity. It is one of the leading organizations dedicated to the preservation of natural areas in the Laurentians with approximately 1,227 acres of conservation lands under ownership located in the municipalities of Ivry-sur-le-Lac, Ste-Agathe-des-Monts and Saint-Faustin-Lac-Carré. Please see link below to the joint press release issued today by Conservation Manitou, Nature Conservancy of Canada, and Environment and Climate Change Canada. After 4 years of intense activity, 2017 was a time to catch our breath, consolidate our finances, and plan strategically for the next wave of land acquisitions. Your land conservancy realized several notable achievements last year. Firstly, Shirley McCall Stikeman and Conservation Manitou were recognized by Environment and Climate Change Canada for their efforts in protecting natural habitats, namely the 247-acre Lac de la Loutre (Atwater Lake) property. Secondly, we purchased 49 acres of forest between the west-end of Lake Manitou and Lake Brazeau for $21,000. Post year-end, we closed an additional 25 acres donated by the estates of Mary Powell and David Culver. We also formed a partnership with Nature Conservancy of Canada to acquire the 541-acre Barbara Richardson Wildlife Foundation property located just west of Lake Manitou with the goal of maintaining ecological connectivity in the region. As a result, Conservation Manitou today owns or co-owns a total of 1,221 acres of conservation lands. Finally, funds pledged since the 2016 launch of the Capital Campaign have reached just over $200,000 or half our target. This is good progress and has allowed us to fully repay the balance of sale and capitalize the Stewardship Fund with $50,000. We would like to encourage your continuing support to endow the fund with at least $250,000 so that income generated can cover the annual carrying costs of our conservation lands. Donating to Conservation Manitou is an investment in our ecological assets that pays us dividends every day in the form of fresh air, clean water, erosion protection, enjoyment of nature and healthy living. Thanks to the strength of our community we have accomplished something incredible of which we should all be very proud. Please come and celebrate our 5th anniversary at the Annual Members Meeting, Saturday May 19 at 2pm at Place Lagny in Ste-Agathe-des-Monts. February 20, 2018 (Saint-Faustin-Lac-Carré, Quebec) – CONSERVATION MANITOU is pleased to announce that it has acquired, in co-ownership with NATURE CONSERVANCY OFCANADA, the 541-acre Barbara Richardson Wildlife Foundation property located in Saint-Faustin-Lac-Carré. This private nature reserve is located approximately 3 km west of Lake Manitou where CONSERVATION MANITOU is active and owns 680 acres of conservation lands, and 2 km south of lac Cornu. The partnership between the two organizations is a natural one because of the large protected forest areas each owns in the vicinity, which both partners view as being key to maintaining ecological connectivity in the region. The Barbara Richardson Wildlife Foundation was created in 1969 to hold natural environments that the late Barbara Richardson wished to protect. The acquired property comprises two lakes, lac Caché and lac en Cœur, wetlands, streams, mountain peaks and a valley, which are home to a wide diversity of flora and fauna including several species that are threatened or vulnerable. CONSERVATION MANITOU is a registered charity and qualified recipient of Environment and Climate Change Canada’s Ecological Gifts Program. Its mission is to preserve and protect the ecosystem and natural environment of Lake Manitou and its surroundings, by acquiring land and conservation easements, either donated or purchased, and providing stewardship in perpetuity. 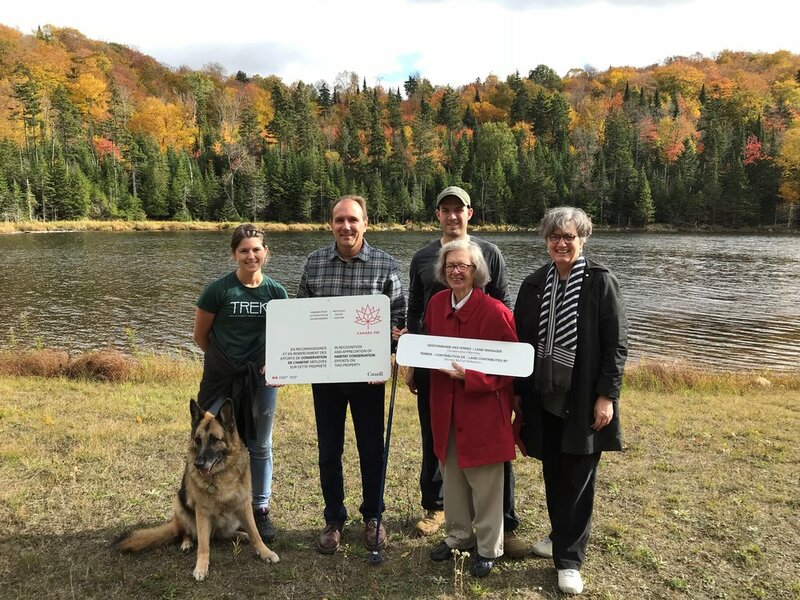 It is one of the leading organizations dedicated to the preservation of natural areas in the Laurentians with approximately 1,220 acres of conservation lands under ownership located in the municipalities of Ivry-sur-le-Lac, Ste-Agathe-des-Monts and Saint-Faustin-Lac-Carré. As part of Canada’s 150th anniversary of confederation celebrations this year, Environment and Climate Change Canada is recognizing a representative group of Canadians who have set aside private lands for long-term conservation, through sale, donation, or conservation agreement. 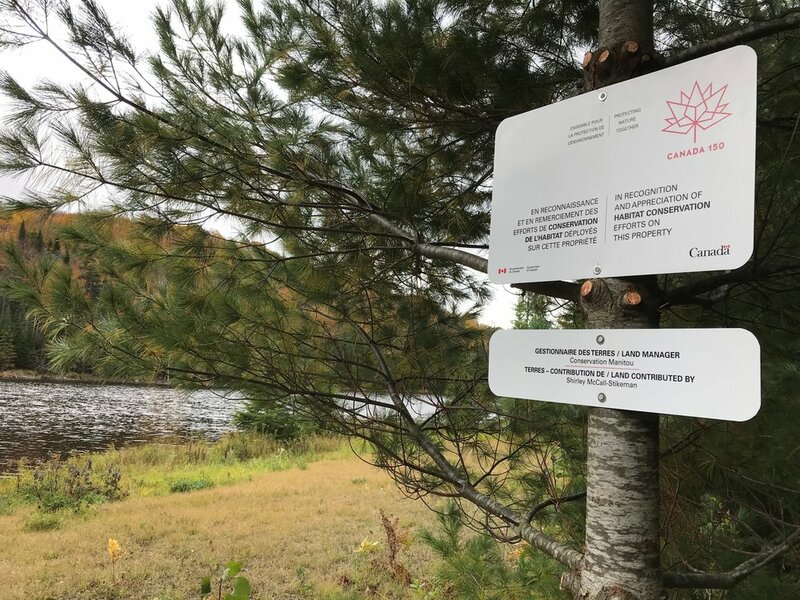 Canada 150 commemorative plaques are being installed on 150 properties across this great country to celebrate the exceptional habitat and biodiversity benefits of the properties. Shirley McCall Stikeman's donation of her Lac de La Loutre property, which comprises over 245 acres, was a recipient of 1 of the 150 plaques awarded. Conservation Manitou couldn't be more proud! This past Sunday we held a small ceremony at Atwater Lake to celebrate this occasion and as well to affix the plaque on a tree near the lake. August 4, 2017 (Ivry-sur-le-Lac, Quebec) – CONSERVATION MANITOU is pleased to announce that it has acquired an additional 49 acres of forest between Lake Brazeau and the north-west end of Lake Manitou, for a price of $21,000. This property contains significant wetlands and a section of the historic Laurentian ski trail connecting Lake Manitou and Cornu Lake. The land is adjacent to the 49 acres of steep ridge land donated by Jennifer, John and Dinah Patton last December, bringing total conservation lands held in this area to 98 acres. As previously announced, CONSERVATION MANITOU launched a capital campaign to raise a minimum of $400,000 and create a Stewardship Fund to support the ongoing costs of its conservation lands. To date over $200,000 has been pledged by both current and new members. Donors are encouraged to donate before August 31, in order to qualify for the giveaway of a custom Manitou stand-up paddleboard. CONSERVATION MANITOU is a registered charity and qualified recipient of Environment Canada’s Ecological Gifts Program. Its mission is to preserve and protect the ecosystem and natural environment of Lake Manitou and its surroundings, by acquiring land and conservation easements, either donated or purchased, and providing stewardship in perpetuity. It currently own 655 acres of conservation lands with over 2 kilometers of shoreline on Lake Manitou, Horseshoe Lake, and Atwater Lake. CONSERVATION MANITOU is one of the leading organizations dedicated to the preservation of natural areas in the Laurentians. Dear Members and Friends, It is with great pleasure and pride that we present you with CONSERVATION MANITOU's 2016 Annual Report attached, and cordially invite you to our 4th Annual Meeting of Members to be held Saturday, May 20, 2017 at 2:00PM at the Ivry-sur-le-lac Town Hall. 1- Raised nearly $2 million in cash donations from over 140 members and received $2.9 million in land donations from 6 landowners. 2- Acquired 606 acres of forested land with 4,400 feet of shoreline on Lake Manitou and 2,500 feet of shoreline on Horseshoe Lake. 3- Rezoned 228 acres with the help of the Municipality of Ivry-sur-la-Lac. 4- Created 6 protected natural area around Lake Manitou. 5- Limited our operating costs to 1.1% of donations and grants received on a cumulative basis since our foundation. 6 -Become one of the leading registered charity in the Laurentians focused on land conservation. 7-Started building a Stewardship Fund to help cover the ongoing carrying costs of holding our conservation lands. We have achieved these results with the strong support of our members, the Municipality of Ivry-sur-le-Lac, and other like-minded organizations. A heartfelt thanks to all those who are helping us Preserve the Future Together ! December 9, 2016 (Ivry-sur-le-Lac, Quebec) – CONSERVATION MANITOU is pleased to announce that it has acquired 247.3 acres located in Ste-Agathe-des-Monts, south of Lake Manitou. This property surrounds and includes Lac de la Loutre, known locally as Atwater Lake. This ecologically significant area, with its numerous ridges, hilltops and wetlands frequented by fox, deer, moose and bear, was donated to us by Shirley McCall Stikeman under Environment Canada’s Ecological Gifts Program. As announced during its Annual Meeting, CONSERVATION MANITOU has recently launched a capital campaign in order to raise a minimum of $400,000 and create a Stewardship Fund to support the ongoing costs of its numerous conservation lands. To date over $150,000 in pledges has been received from both current and new members. All donors will receive charitable tax receipts and are encouraged to make donations prior to this year-end in order to qualify for 2016 income tax credits. CONSERVATION MANITOU is a registered charity and qualified recipient of Environment Canada’s Ecological Gifts Program. Its mission is to preserve and protect the ecosystem and natural environment of Lake Manitou and its surroundings, by acquiring land and conservation easements, either donated or purchased, and providing stewardship in perpetuity. It currently own 557 acres of conservation lands with over 2 kilometers of shoreline on Lake Manitou and Horseshoe Lake. It is one of the leading organizations dedicated to the preservation of natural areas in the Laurentians. June 1, 2016 (Ivry-sur-le-Lac, Quebec) – CONSERVATION MANITOU is pleased to announce that it has acquired its first property in St-Faustin-Lac-Carré, close to the south-western shores of Lake Manitou. This 25-acre forested parcel comprises a hilltop, wetlands which source a stream flowing into Horseshoe Lake, a local landmark featuring a huge glacial erratic known as Hanging Rock, and a popular section of the local hiking and cross-country ski trail. Including the recently announced Atwater Lake land donation, CONSERVATION MANITOU will own 560 acres of forested conservation lands with over 2 kilometers of shoreline on Lake Manitou and Horseshoe Lake. It is one of the leading organizations dedicated to the preservation of natural areas in the Laurentians and is a registered charity and a qualified recipient of Environment Canada’s Ecological Gifts Program. Its mission is to preserve and protect the ecosystem and natural environment of Lake Manitou and its surroundings, by acquiring land and conservation easements, either donated or purchased, and providing stewardship in perpetuity. May 21, 2016 (Ivry-sur-le-Lac, Quebec) – CONSERVATION MANITOU is proud to announce that it will acquire 250 acres of forested land located in Ste-Agathe-des-Monts, south of Lake Manitou and surrounding Lac de la Loutre, known locally as Atwater Lake. Almost forgotten today, James Sherrard and Lucy Atwater, grand-daughter of the 19th century industrialist Edwin Atwater for whom Atwater Avenue in Montreal is named, were significant actors in the early days of Lake Manitou. In 1918, they acquired Viscount Raoul Ogier d’Ivry’s boathouse at the entrance to Johnson’s Arm, followed two years later by the purchase of what is today Shirley Stikeman’s lakefront property. In 1934, after their just completed fieldstone house caught fire, the Sherrards sold that property to Alan McCall, Shirley’s father, and built a new home up the hill across Lake Manitou South Road. They shared this new property with Lucy’s unmarried sister Edith Atwater. Edith took a fancy to the small lake up at the back of the property and built a cabin on what local residents called Miss Atwater’s Lake. After passing through several hands and becoming known as Levesque’s Farm, Shirley Stikeman had the foresight to acquire the former Sherrard property in 1998, and is now donating 250 acres of it to CONSERVATION MANITOU under Environment Canada’s Ecological Gifts Program. Including the above, CONSERVATION MANITOU will own 535 acres of forested conservation lands with over 2 kilometers of shoreline on Lake Manitou and Horseshoe Lake. It is one of the leading organizations dedicated to the preservation of natural areas in the Laurentians and is a registered charity and a qualified recipient of Environment Canada’s Ecological Gifts Program. Its mission is to preserve and protect the ecosystem and natural environment of Lake Manitou and its surroundings, by acquiring land and conservation easements, either donated or purchased, and providing stewardship in perpetuity. Dear members and friends of Conservation Manitou: 2015 was a very active year. We acquired 188 acres by way of land donations under the Ecological Gifts Program thanks to the generosity of the Culver, Dobell, McCall and Stikeman families. Subsequently, the McCall Island Foundation transferred its 17-acre island to us, bringing our total land holdings to 285 acres. This transfer required the consent of Nature Conservancy of Canada, which is a strong endorsement of our preservation work. Our conservation lands are located in three key areas: the Townsend Nature Preserve on Lake Manitou’s north-eastern shore; the Powell Reserve along Chemin Fyon on the north side; and the Horseshoe Reserve between Horseshoe Lake and Lake Manitou’s south-western shore. With more acquisitions planned, we are launching a capital campaign to repay the balance due on land purchased for the Townsend Nature Preserve and to build a stewardship fund. Over 130 donors have contributed more than $1.7 million, and our goal is to raise another $400,000. We particularly need the financial support of those who have not yet donated but who are benefiting from our conservation efforts. For its part, the municipality of Ivry-sur-le-Lac has helped lower our operating costs by rezoning our properties which reduces our taxes. Ivry’s councillors understand the importance and benefits of protecting our “natural capital” and are inspiring other municipalities to do the same. We thank all of our donors for their generosity and support, and hope to see you at our 3rd Annual Meeting on Saturday May 21 at 2pm at the Ivry town hall. Please see attached our Annual Report below. July 8, 2015 (Ivry-sur-le-Lac, Quebec) – CONSERVATION MANITOU is pleased to announce thatit has completed the acquisition of nearly 140 acres of forested land on the north side and on the southwestern shore of Lake Manitou, and on the north shore of Horseshoe Lake, by way of donations under Environment Canada’s Ecological Gifts Program. The properties acquired include prominent hilltops and ridges, wetlands and streams feeding into both lakes, as well as nearly 2,500 feet of boggy waterfront on Horseshoe Lake and over 1,000 feet of steep shoreline on Lake Manitou. “We are very grateful to the late Tony Dobell, as well as Shirley Stikeman and David McCall, for entrusting us with the preservation and stewardship of these ecologically sensitive lands which include shoreline on vulnerable Horseshoe Lake, the largest body of water flowing into Lake Manitou” states Stephen Takacsy, Chair of CONSERVATION MANITOU. The lands also feature a section of the historic Laurentian ski trail which will also be preserved. CONSERVATION MANITOU is one the leading organizations dedicated to the preservation of natural areas in the Laurentians. It is a registered charity and a qualified recipient of Environment Canada’s Ecological Gifts Program. Its mission is to preserve and protect the ecosystem and natural environment of Lake Manitou and its surroundings, by acquiring land and conservation easements, either donated or purchased, and providing stewardship in perpetuity. Dear Members and Friends, Please find attached CONSERVATION MANITOU's 2014 Annual Report and Notice of Annual Meeting of Members to be heldSaturday, May 16, 2015 at 2:00PM at the Ivry-sur-le-lac Town Hall. Become the largest registered charity dedicated to land conservation in the Laurentians. Increased membership to 120 members and raised $1.7 million in donations and pledges. Acquired or are in the process of acquiring 297 acres of forest in Ivry-sur-le-lac including 4,400 feet of shoreline on Lake Manitou and 2,500 feet of shoreline on Horseshoe Lake. Created the Townsend Nature Preserve on the north-eastern shores of Lake Manitou of which 81 acres have been rezoned with the help of the municipality. Maintained annual operating costs under 1% of cumulative donations received. We have achieved these milestones together and our ongoing activities and future success depend on your continued support. A huge thank you to all those who have contributed so far ! 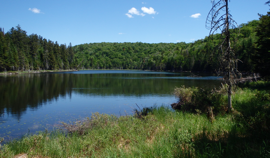 July 29, 2014 (Ivry-sur-le-Lac, Quebec) – CONSERVATION MANITOU is pleased to announce its second purchase of land on the north shore of Townsend Bay, situated on the east side of Lake Manitou. The latest acquisition comprises several properties totalling approximately 47 acres which form part of a steep forested mountain ridge and includes over 1,000 feet of lakefront. Part of the purchase includes parcels acquired from Doreen Adams under Environment Canada’s Ecological Gifts Program. An ecological assessment, performed by biologists from Nature Action Quebec, confirmed the presence of old growth forest and rated the land as having very high conservation value. CONSERVATION MANITOU now owns approximately 80-acres of forest and nearly 3,200 feet of shoreline. This area forms part of the Townsend Nature Preserve, newly named in honor of Samuel Baillairgé Townsend (1861-1937) who purchased these lands in 1906. Samuel Townsend’s six great-grandchildren: Stephen Adams, Jorie Adams, Catherine Campbell McLean, Willa Campbell, Stewart Campbell, and Alexandra (Sandy) Adams have been instrumental in supporting the creation of the Townsend Nature Preserve.